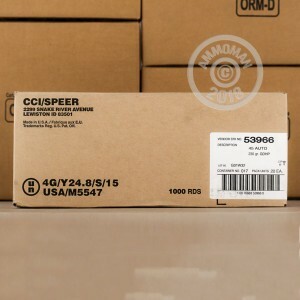 Packaged in a 50 round "Law Enforcement" box with 20 boxes per case, these .45 ACP cartridges from Speer are one of the best defensive loads available for 1911s and other .45 pistols. Each round fires a 230 grain jacketed hollow point bullet at 890 feet per second. 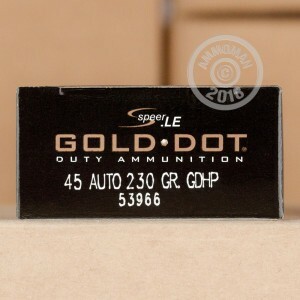 Speer Gold Dot bullets use a molecular bonding process to eliminate any risk of core-jacket separation. Each version of the Gold Dot is optimized for its particular caliber and weight to produce ideal terminal performance. 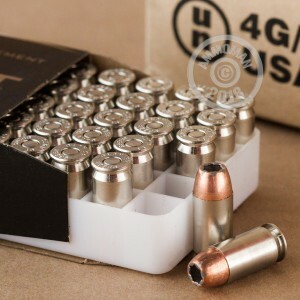 The strong real world track record of this ammo in self-defense situations has made it one of the most popular choices for police departments and concealed carry licensees in the country. Because they're so widely used and produced in such large quantities, they're also a bit less expensive than most premium hollow points. Gold Dot ammunition is loaded in Lewiston, Idaho using non-corrosive Boxer primers and nickel-plated brass cases. This is a standard pressure load that will work great in full size and compact pistols alike.